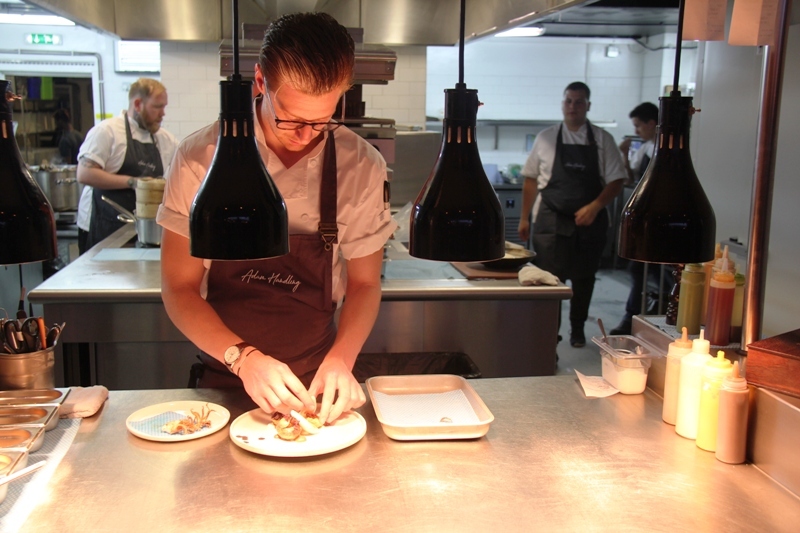 It was November 2014 when I last had the pleasure of Adam Handling. He was flushed with success at getting to the Professional Masterchef Final. 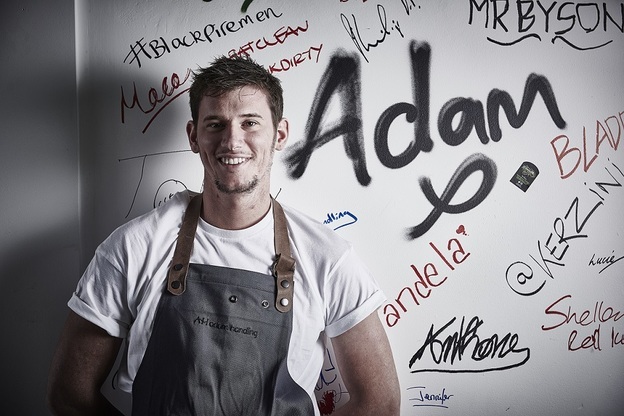 At the time he was head chef of the Caxton Grill at St. Ermin’s Hotel and it appropriately changed to Adam Handling at Caxton as recognition of his achievement. Back then I remember thinking he was punching way above his weight at Caxton and it was only a matter of time before he would be weaving his culinary magic on a much bigger stage. Not that I am casting aspersions at St. Ermin’s, it is one of London’s hidden gems, but it gave Adam the experience and confidence he needed to ultimately do his own thing and winding forward 3 years here we are reunited once again. 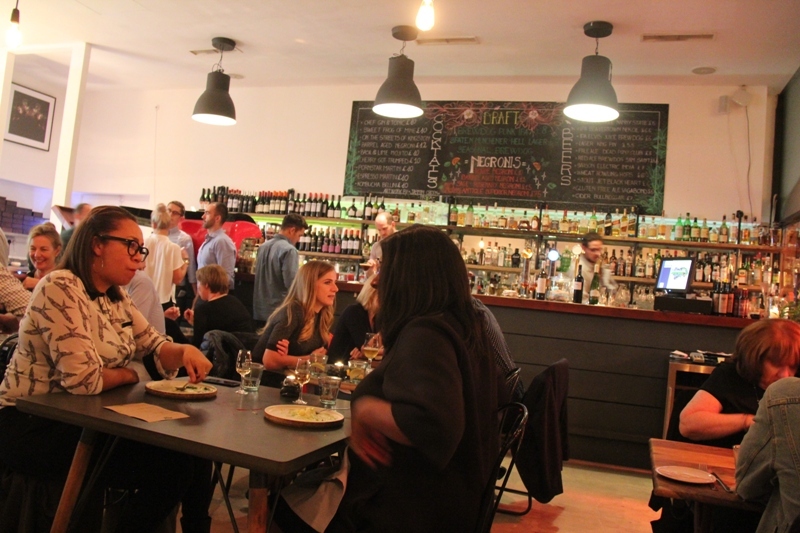 The Frog Restaurant is so deep into Spitafields you almost need an on-trend passport to find it, tucked away as it is in Ely’s Yard, just off bustling Hanbury Street. Things seem to be moving in the right direction for Mr. Handling since he became independent; a second Frog has just opened in Covent Garden and there are plans for more in the pipeline. 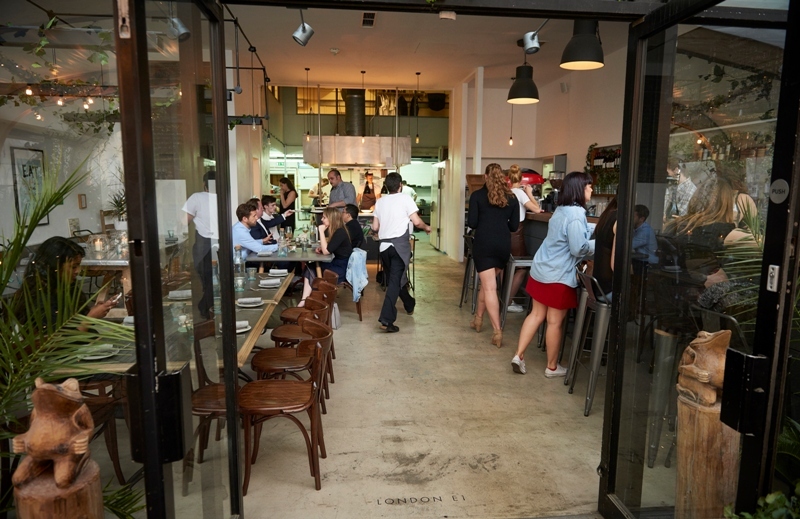 All well and good I say, but do Adam’s heavily Asian-influenced dishes stack up with the hip crowd; is that culinary stardust working its magic? The interior design is certainly a bulls eye; very bohemian meets industrial with bare piping the odd naked light bulb and an eclectic mix of furniture. 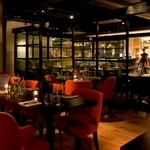 A huge bar dominates one wall and the open kitchen is pure theatre. A new indoor terrace extension has been added with a few swing chairs and hops dangling from the rafters giving it a leafy London suburban feel. There’s plenty of art on the walls courtesy of some of London’s young creative talents, which just seems to be perfectly at home given the abstract interiors. 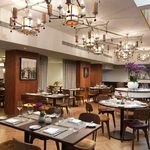 There is a five course tasting menu with a wine paring (there are also beer and alcohol free pairings) and a sharing British tapas style menu if you just want to dive in head first. 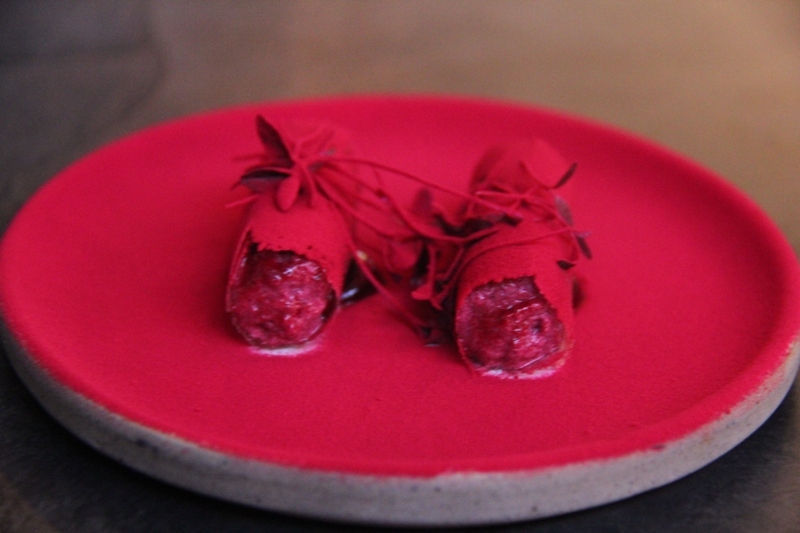 Looking through the menus, I spot a few familiar signature Handling nibbles like beetroot, beetroot and more beetroot (fond memories of that one) , cheese doughnuts and bread with chicken butter plus many new ones that promise more of that flavoursome Asian mix. 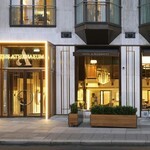 It seems I’m here on the first night of Jamie Park’s tenure as new Head Chef as Adam is busy with the new Covent Garden launch. Park was Adam’s right hand for two years at St. Ermin’s before joining him at The Frog so they certainly have shared history. He cuts an imposing figure at the front of the open kitchen examining and tinkering with every plate before it’s allowed out. It’s a big night for him and I’ve got my fingers crossed. 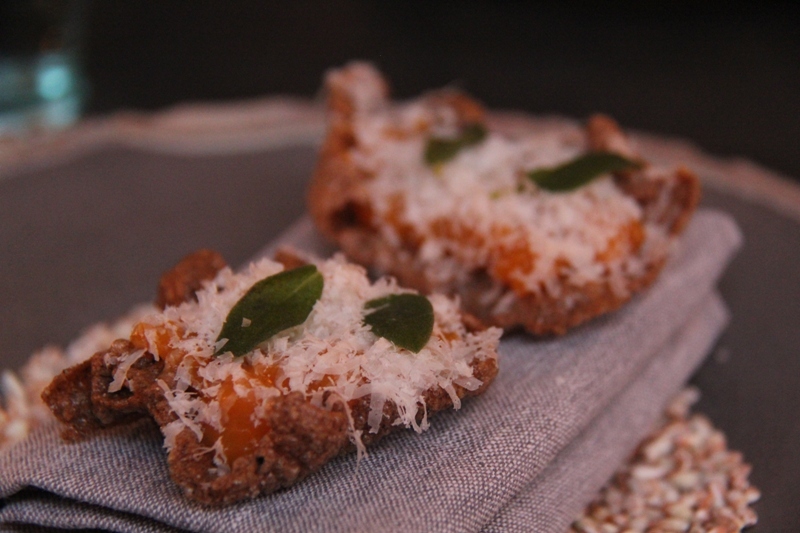 First up, a duo of snacks, two butternut squash fritters with sage and parmesan (£4) delicately placed on a folded napkin and the Handling legend that is beetroot, beetroot and more beetroot (£4), just to see if it is still as good as I remember. Both didn’t disappoint. The squash was agreeable both crunchy and flavoursome at the same time, the beetroot was, well, like an old friend who somehow has got better with age. 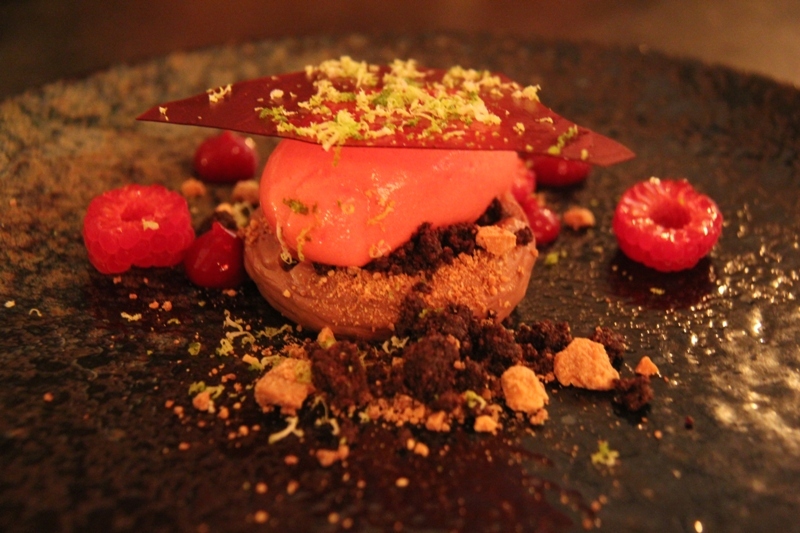 There are some who turn their noses up at a dish like this. Me, I just sit back and revel in the flavours. Of course it helps when you can wash them down with a crisply paired Grauer Burgunder 2014. Next up, some choices from the Garden section of the menu. 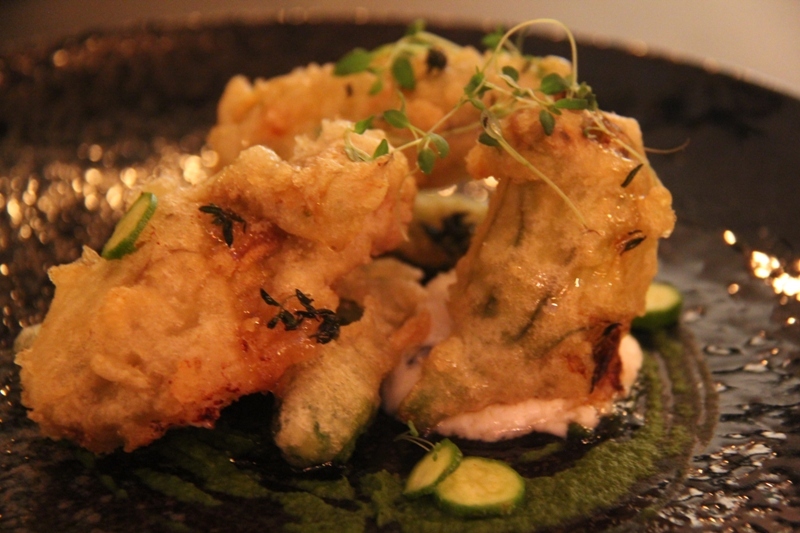 A quite delicious courgette tempura with goats curd and honey (£9), slices of celeriac with apple dates and an egg yolk (£11) and a deliciously creamy burrata ball with cucumber and black olive caramel delightfully dressed with purple and orange petals (£10). Now here’s something different. They’re brought to the table by the chef that prepared them. This is standard procedure at The Frog; and rather than a novelty, I see it as a way of properly handing over the passion baton. I mean, who best to describe a dish than the person who put it on the plate. Another crispy Pinot Gris for this section, this time a 2014 from Oregon. By now, the Frog is filling up nicely, the conversation volume level is creeping towards 10 and Jamie is barking out orders as the action heats up in the kitchen. Another Handling signature is next, Mac & cheese.(£15). 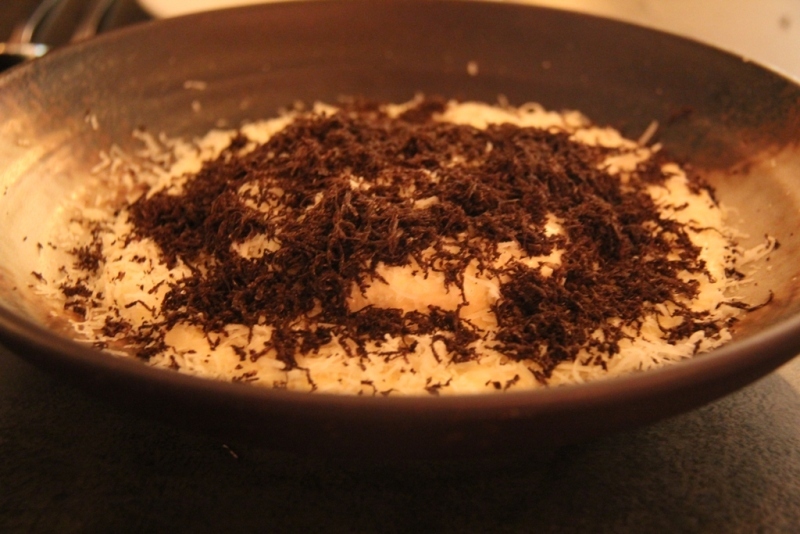 This is some dish, lathered all over with Australian truffles by another grater wielding chef. But this is no ordinary mac & cheese, each tube of macaroni has been injected with a three cheese mix, (definitely cheddar and parmesan but I struggle to get the third) which lie beneath a an aerated blanket of the same mix and then topped by those impressive truffles. The Land section raises eyebrows. 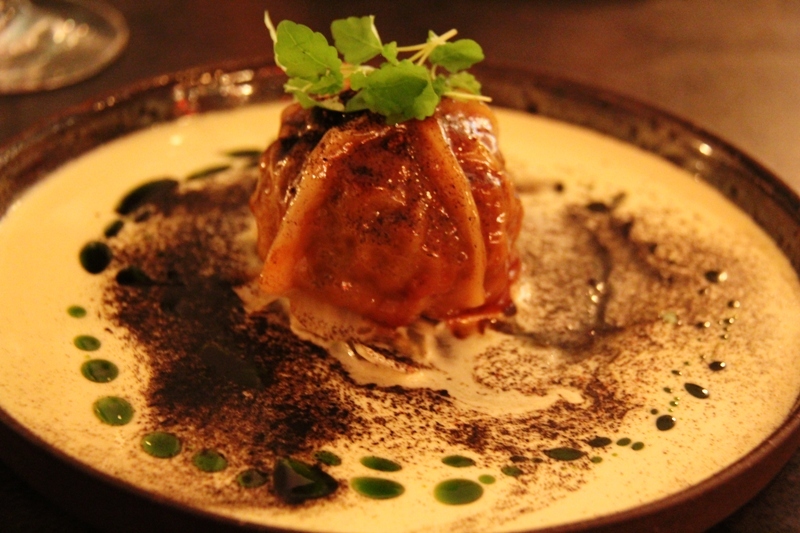 Spiced slow cooked ox cheek dumpling with lemongrass velouté (£14) is pure Asian influenced. A startlingly good mix of flavours – perhaps an homage to Japanese styling? No matter, I devour it. The piggy with cauliflower and kimchi (£15) is the eyebrow raiser. The cauli is brown, looked like meat, wasn’t. Expected it to be hot, wasn’t. Everything on the plate was not what it seemed. The mystery made it all the better for me. 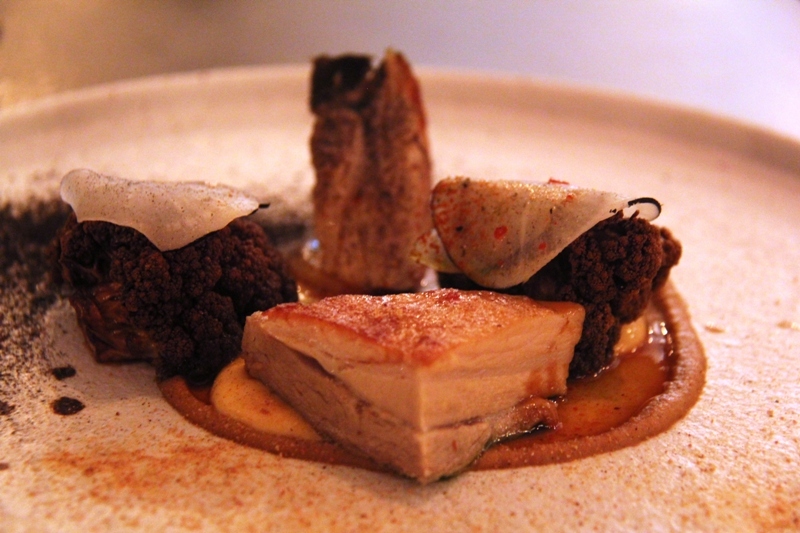 Another triumphant dish made all the more edible by a yummy Spanish red called Goru – The Old Man 2014. “Hell of a night” he says confidently. I had uncrossed my fingers a long time ago. 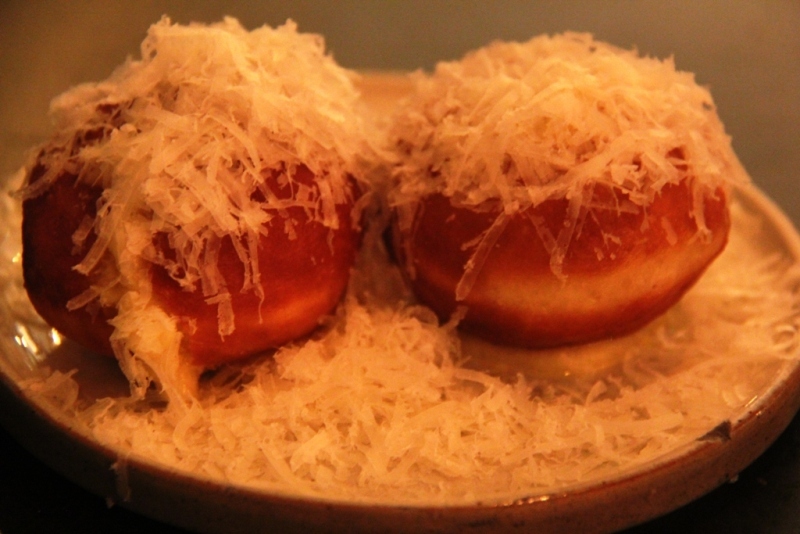 The doughnuts for me are better off earlier because they’re more savoury than sweet. That apart, the tofu is darkly extravagant, one for the chocolate connoisseur. As a parting gift, wine waiter Ferenc materialises with a TokajI from his native Hungary, an Aszu 5 Puttonyos 2009. 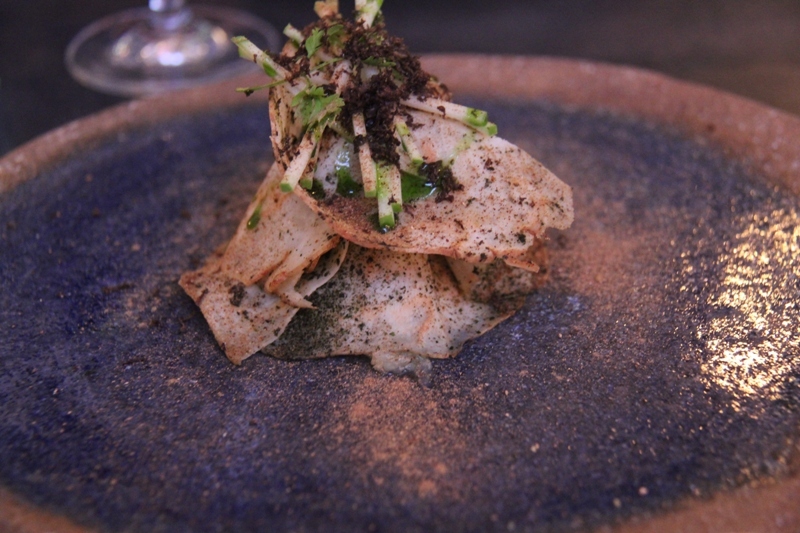 The Frog Restaurant is the perfect stage for Adam Handling’s extraordinary culinary creations and the new Frog by Adam Handling Covent Garden promises more of the same but for the less on-trend perhaps. I await more Frog spawning. It’s just a matter of time.